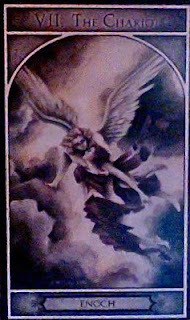 Today's Draw: The Chariot from the Watcher Angel Tarot—Enoch. If you're on a spiritual path, why do you think you're on it? What do you hope to attain? Ultimately, where do you think all the work you do here on earth will land you in the afterlife? The chariot is traditionally drawn with a charioteer marshaling horses so that he may move forward. The horses are sometimes going in opposing directions, meaning the charioteer needs to exercise control and force to balance the opposing energies so he can progress in his intended direction. In the Watcher Angel Tarot, the chariot represents the prophet Enoch who rose to the heavens, then became the archangel Metatron. Metatron's power is thought to be second only to God's. In this deck, the movement represented by the Chariot is upward. It's ascension into our higher selves. The way upward is as difficult as the way forward. The opposing parts of our minds keep us from traveling into our divinity in a straight line. If you consider our soul the charioteer and our humanity the horses, it makes sense. Our soul knows where to steer us, but our human-like ego, doubt and fear have to be reigned in before we can share the soul's visions and move forward, upward. Some of the things that can pull the charioteer off course are seeing ourselves as separate from others, holding resentments in our hearts, choosing not to apologize when we know we're wrong, staying safe when it's time to grow and doubting in the magic of our higher power. Of course, there are thousands of things that steer us off course, but most will have to do with separation, fear and doubt. Not that there's anything wrong with any of that. It's all part of being human, and that's what we're here for, after all. As far as I believe, we all end up in the same place in the end, regardless of how far onward or upward we travel here on earth. Once we let go of life, the charioteer faces no more resistance. To me, the spiritual path has nothing to do with getting to "heaven" or the state of ascension faster or more completely. It's about those rare moments of experiencing divinity here on earth. When our souls are sent here, they come with the mantle of humanity attached to them. When we're in the afterworld in our perfect soul incarnation, we see that world through the eyes of purity and truth. And we can look down on earth from a distance. But the only time we get to be on earth and truly experience the beauty and truth of this incarnation is when we look at it through the eyes of our souls. And to do that, we need to strip off the fear, ego and doubt. When we look into this world's truth, we look into our own. And, in that way, the spiritual path makes the human experience more special. For me. Regardless of whether we choose a spiritual path in this life or not, it is a choice. Why have you chosen the path you're on? And keep in mind, I'm not talking about God or religion, necessarily, but the human as a spirit traveling on the earth. For as much as I talk about spirituality, I neither believe in any religion, nor any deity. When I speak of God, I speak of the collective of all things...the whole that is greater than the sum of it's parts, rather than a power looking down on us and taking notes. If you believe in the spirit nature of humans, why do you ultimately believe it? And if you don't believe it, why do you ultimately not believe it? What do you think our role as humans is?